Heat oven to 450°F. Place pie crust in 9-inch pie pan or 10-inch tart pan with removable bottom as directed on box for One-Crust Filled Pie. Bake 9 to 11 minutes or until lightly browned. Cool. In small saucepan, melt 6 oz chocolate and the butter over low heat, stirring constantly; remove from heat. In small bowl, beat powdered sugar and cream cheese. Stir in melted chocolate mixture; beat until smooth. Add 1 cup of the cherry pie filling; blend gently. Set aside remaining pie filling. Spread mixture evenly into cooled crust. Refrigerate 1 hour. In small bowl, mix topping ingredients. Spread evenly over cooled chocolate layer. Spoon remaining cherry pie filling in a band around outer edge of tart. Refrigerate until serving time. Make this impressive chocolate-cherry tart up to 24 hours ahead of time and store covered in the fridge. 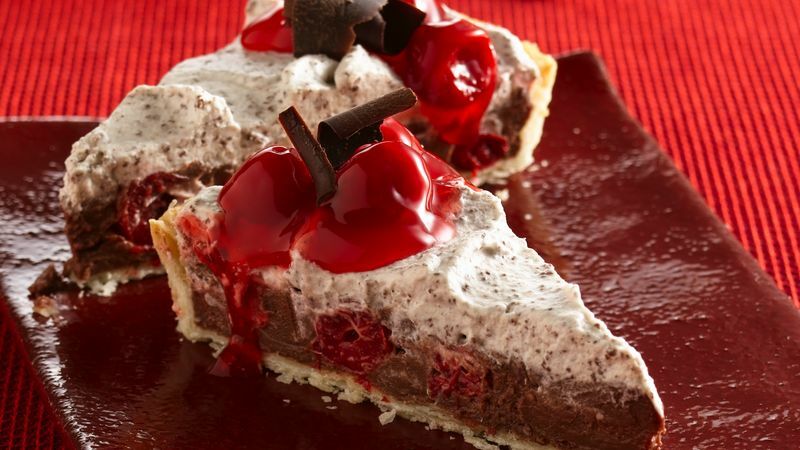 Instead of using grated chocolate, garnish the top of the pie with whipped cream and chocolate curls. Or, garnish each slice with a dollop of whipped cream and a well-drained, stemmed maraschino cherry or a chocolate-covered cherry!